CanadaVet.com Blog: 15% off all Bayer Product Packs! 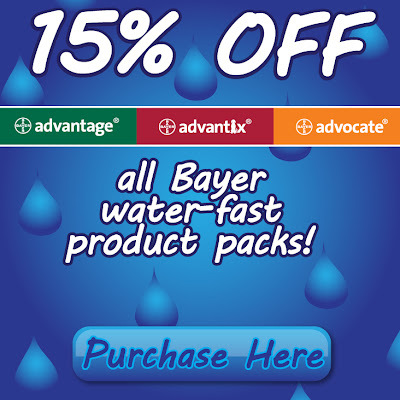 15% off all Bayer Product Packs! CanadaVet.com is having a spring sale! Get 15% off all water-fast product packs from Bayer this month at CanadaVet.com. Protect cats, dogs, rabbits or ferrets from fleas an lice with Advantage; available in 4, 8 or 12 application packs. For the ultimate canine protection from ticks, fleas, lice, mosquitoes and flies try Advantix, available in 4, 8 and 12 packs. Keep your cat or dog safe from intestinal worms, lice, mites and fleas when you use Advocate; available in 3, 6 and 12 packs. Enter the coupon code below to receive 15% off when you purchase any Bayer pack at CanadaVet.com. This is a springtime sale so offers end May 31st, 2012. Order online at CanadaVet.com today to save! Thanks Canada Vet! Its always a challenge taking care of our pooches with how much pet meds costs and all but this will sure help.